For your convenience we have posted excerpts from some of the most widely used standards and national electrical & building codes referencing smoke and carbon monoxide alarms. Please note that these are only excerpts, and you must consult all local and national building codes and AHJ's (Authority having Jurisdiction) before beginning any installations. Standards: ANSI/UL 217 Single and Multiple Station Smoke Alarms. 11.5.1.1 Smoke Detection. Where required by applicable laws, codes, or standards for the specified occupancy, approved single-station and multiple-station Smoke Alarms shall be installed as follows: (1) In all sleeping rooms Exception: Smoke Alarms shall not be required in sleeping rooms in existing one- and two-family dwelling units. (2) Outside of each separate sleeping area, in immediate vicinity of the sleeping rooms. 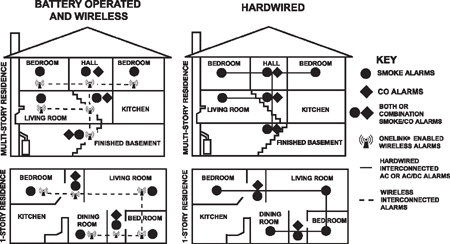 (3) On each level of the dwelling unit, including basements Exception: In existing one- and two family dwelling units, approved Smoke Alarms powered by batteries are permitted. A.11.8.3 Are More Smoke Alarms Desirable? The required number of Smoke Alarms might not provide reliable early warning protection for those areas separated by a door from the areas protected by the required Smoke Alarms. For this reason, it is recommended that the householder consider the use of additional Smoke Alarms for those areas for increased protection. The additional areas include the basement, bedrooms, dining room, furnace room, utility room, and hallways not protected by the required Smoke Alarms. The installation of Smoke Alarms in kitchens, unfinished attics, or garages is not normally recommended, as these locations occasionally experience conditions that can result in improper operation. 9.6.2.10.1 Where required by another section of this Code, single-station and multiple-station smoke alarms shall be in accordance with NFPA 72®, National Fire Alarm Code®. System smoke detectors in accordance with NFPA 72®, National Fire Alarm Code®, and arranged to function in the same manner as single-station or multiple-station smoke alarms shall be permitted in lieu of smoke alarms. 9.6.2.10.2 Smoke alarms, other than battery-operated devices as permitted by other sections of this Code, or battery-operated devices complying with 9.6.1.3 and the low-power wireless system requirements of NFPA72®, National Fire Alarm Code®, shall receive their operating power from the building electrical system. (1) The requirement of 9.6.2.10.3 shall not apply where permitted by another section of this Code. (2) The requirement of 9.6.2.10.3 shall not apply to configurations that provide equivalent distribution of the alarm signal. 9.6.2.10.4 The alarms shall sound only within an individual dwelling unit, suite of rooms, or similar area and shall not actuate the building fire alarm system, unless otherwise permitted by the authority having jurisdiction. Remote annunciation shall be permitted. 24.3.4 Detection, Alarm, and Communications Systems. Smoke alarms or a smoke detection system shall be provided in accordance with either 24.3.4.1 or 24.3.4.2, as modified by 24.3.4.3. 24.3.4.2 Dwelling units shall be protected by an approved smoke detection system in accordance with Section 9.6 and equipped with an approved means of occupant notification. 24.3.4.3 In existing one- and two-family dwellings, approved smoke alarms powered by batteries shall be permitted. Early warning detection is best achieved by the installation of fire detection equipment in all rooms and areas of the household as follows: A Smoke Alarm installed in each separate sleeping area (in the vicinity, but outside bedrooms), and Heat or Smoke Alarms in the living rooms, dining rooms, bedrooms, kitchens, hallways, finished attics, furnace rooms, closets, utility and storage rooms, basements, and attached garages. If the alarm is exposed to 400 ppm of CO, IT MUST ALARM BETWEEN 4 and 15 MINUTES. If the alarm is exposed to 70 ppm of CO, IT MUST ALARM BETWEEN 60 and 240 MINUTES. * Approximately 10% COHb exposure at levels of 10% to 95% Relative Humidity (RH). The unit is designed not to alarm when exposed to a constant level of 30 ppm for 30 days. CO Alarms are designed to alarm before there is an immediate life threat. Since you cannot see or smell CO, never assume it’s not present. Standards: Underwriters Laboratories Inc. Single and Multiple Station carbon monoxide alarms UL2034. According to Underwriters Laboratories Inc. UL2034, Section 1-1.2: “Carbon monoxide alarms covered by these requirements are intended to respond to the presence of carbon monoxide from sources such as,but not limited to, exhaust from internal-combustion engines, abnormal operation of fuel-fired appliances, and fireplaces. CO Alarms are intended to alarm at carbon monoxide levels below those that could cause a loss of ability to react to the dangers of Carbon Monoxide exposure.” This CO Alarm monitors the air at the Alarm, and is designed to alarm before CO levels become life threatening. This allows you precious time to leave the house and correct the problem. This is only possible if Alarms are located, installed, and maintained as described in this manual. Gas Detection at Typical Temperature and Humidity Ranges: The CO Alarm is not formulated to detect CO levels below 30 ppm typically. UL tested for false alarm resistance to Methane (500 ppm), Butane (300 ppm), Heptane (500 ppm), Ethyl Acetate (200 ppm), Isopropyl Alcohol (200 ppm) and Carbon Dioxide (5000 ppm). Values measure gas and vapor concentrations in parts per million. Audible Alarm: 85 dB minimum at 10 feet (3 meters). International Code Council. The ICC founders - the Building Officials and Code Administrators (BOCA), the International Conference of Building Officials (ICBO), and the Southern Building Code Congress International (SBCCI) - created the ICC in response to technical disparities among the three sets of model codes now in use in the U.S.A.
U.S. Census Bureau Construction Statistics www.worldsafety.com A global community center for safety professionals. The site contains an impressive collection of links to a wide variety of safety sites, including sites specializing in fire protection. International Association of Fire Chiefs. Established in 1873, the International Association of Fire Chiefs represents the leadership of over 1.2 million firefighters. IAFC members are the world's leading experts in firefighting, emergency medical services, terrorism response, hazardous materials spills, natural disasters, search and rescue, and public safety legislation. MEA - New York City Building Code. The Materials, Equipment and Acceptance (MEA) Division was created to ensure that certain permanent building materials and appliances meet the minimum standards required in the Building Code, thus increasing the safety in all New York City Buildings.